I must admit to having been intrigued by the thought of this book, as I had read many good reports from over the pond. I knew it was a teen novel, I knew it was ostensibly a romance and I knew it involved vampires. However I knew little else. Looking at the cover, for a moment, you would be forgiven for thinking it wasn’t a teen novel, the cover seems more designed for the mature reader market and that is very appropriate. Whilst this is a teen book, the writing is certainly much more mature than many novels aimed for the teen market – and that is no bad thing as it treats a teen audience with respect and realises that teens can have a good level of literacy. 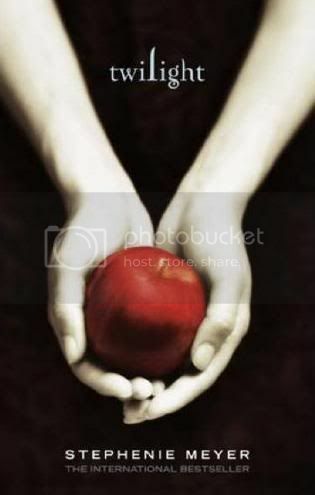 The book is first person and is narrated by Isabella Swan, or Bella as she prefers to be called. Bella moves to the town of Forks to be with her father, Charlie, the local Police Chief. It is not particularly a move she relishes, though she instigated it to allow her mother opportunity to travel with her new husband, as Bella prefers sunny climes and Forks seems to be under an almost perpetual rain cloud. It is clear that Bella sees herself somewhat as a freak and an ugly duckling; in reality she is the source of much attention from the young men in her new school. There is one young man, however, whom she cannot fathom. Edward Cullen is one of several ‘brothers and sisters’, all of whom have been adopted by local, well respected (and rather young looking) Doctor Carlisle Cullen. The Cullen children keep themselves to themselves and Edward, who sits next to Bella in her biology class, seems stand-offish and even hostile towards her. Then he saves her life, in a manner that seems, to Bella, almost superhuman. As their attraction to each other grows Bella discovers the truth. The Cullen’s are vampires. The Native Americans on the nearby reservation know this, referring to them as cold ones and, despite the fact that these vampires do not prey on humans, are extremely wary of them. The vampire lore is very unusual. These vampires prey on animals, but most of their kind hunt humans – the Cullens are unusual in their habits but it allows them to remain in one location longer. They do not have the normal vampiric traits. They do not sleep in coffins, indeed they do not sleep at all, sunlight is not destructive although they avoid it due to the effect it has on their appearance: “His skin… literally sparkled, like thousands of tiny diamonds were embedded in the surface.” This is why they have settled in Fork, the high rainfall means few clear days. They are very strong and fast, much more so than perhaps in other genre tales and the only method of destruction we hear of is for one to be literally ripped apart and the resultant pieces burnt. When they bite they inject venom which painfully incapacitates the victim. If they do not kill the victim, which is rare due to the ensuing feeding frenzy, then that venom burns through the victim turning them. One or two have extra powers. Edward can read minds, although not Bella’s, and Alice Cullen has a precognitive ability. The vampires suspect that these are latent mortal abilities that the vampirism enhances. Their eyes change colour, growing blacker as they become thirstier. They do not need to breathe, though to not do so obviously curtails their ability to use their highly honed sense of smell. The book itself is a teen story but, as I said at the head, the writing is very mature and the book is well written, I found it a good read for an adult as well as a teen. Despite the first person perspective, Meyer draws the characters wonderfully – especially Bella and Edward – and the expert characterisation pulls you in. The book is not a horror. First and foremost it is a romance and, it appears, a doomed romance. Edward wants to avoid Bella because of the danger she is in, she is his perfect type – in a food sense – and he struggles to maintain his self control whenever she is near. Even as it blossoms, and Bella and Edward are unable to deny their love, they cannot consummate as he could accidentally kill her because of his exceptional strength. One nice aspect to this lies in how Meyer chose to portray the romance. Too often we see the vampire who looks like a teen but is of great physical age, whose experience and maturity match their chronological years. Meyer made Edward old chronologically, he was born in 1901, and yet he is romantically inexperienced. This makes the romance very much the first tentative romance of a teenager, perfect for the target audience. Yet as well as the romance this is a book about the outsider, the feeling of alienation most teenagers pass through. There is also a peril element, which comes in the form of non-abstaining vampires – but it is more a dramatic or thriller element than traditionally horrific. This was a good read - and I did devour the book in a couple of days - and it is highly recommended for teen readers. There is enough maturity within the writing, primarily in respect of characterisation, to make this a worthwhile for adults also. A well composed prose with wonderfully drawn characters it deserves 6.5 out of 10.